Respectfully, I think your perception of how this process works is flawed. I followed the VUDU scan to digital process for 18 bluray titles in my library. All 18 titles successfully imported into my VUDU library. After creating a Movies Anywhere account and linking it to my VUDU account, my VUDU library now appears within Movies Anywhere. I then linked my iTunes account to my Movies Anywhere account, providing visibility of my iTunes library within Movies Anywhere. However, NONE of the 18 VUDU "scan to digital" titles imported into my iTunes movie library. My iTunes movie library only contains titles directly purchased from iTunes store and Digital Copy downloads redeemed though iTunes store. The only centralized library of all titles from all linked accounts remains within the Movies Anywhere application. Are you sure you linked Movies Anywhere to the same iTunes account that is logged in on your device? You're the first person I've heard from with this issue. There are some movies and studios here and there that seem to be excluded for mysterious reasons (see the guy earlier who had trouble with the Harry Potter franchise), but the fact that NONE of your purchases are showing up leads me to believe there might be an error in your setup. Yes I am sure. Perhaps you should review your findings. Movies Anywhere does not migrate titles between Retailers. I am sorry that it's not working for you, but Movies Anywhere does, in fact, sync digital purchases across different services. That's the entire point of it. I would suggest trying to contact them for technical support. Are the movies treated as iTunes Purchases at that point? If I never use Vudu again and I disconnect the accounts, will the movies still show up in my iTunes purchases? It appears that they are treated as iTunes purchases, yes. Someone earlier said they un-linked their Movies Anywhere account and the movies remained in their iTunes library, which is an encouraging sign. Perhaps, could it be that VUDU "Disc to Digital" titles don't qualify as "digital purchases"? 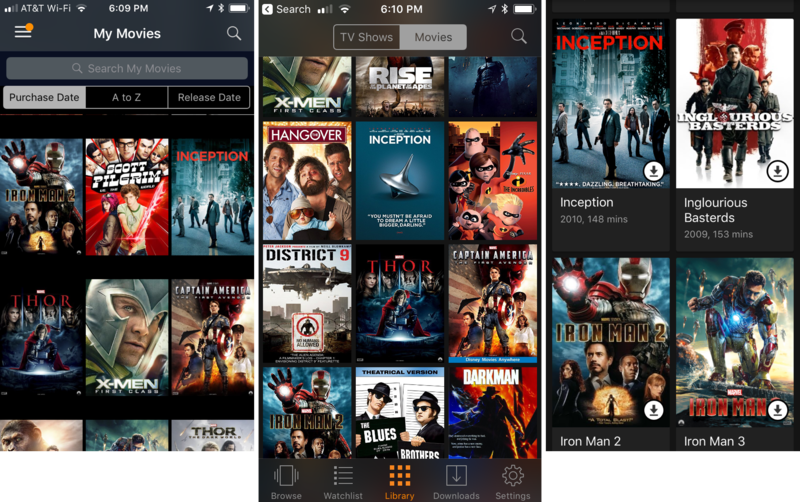 Do you also see all of your iTunes purchased movies within your VUDU library? All of my iTunes purchases from participating studios (Disney, Sony, Fox, Universal, Warner) are now available to stream and download through Vudu, Amazon, and Google Play. That's exactly what Movies Anywhere does. Here are screenshots I just captured separately from Vudu, Amazon and Google Play, confirming that all three stores now have my iTunes purchases available. Inception (a Warner release) and Iron Man 2 (Disney) can be seen in all three. Movies Anywhere works exactly as advertised when it's set up properly. If you continue to have problems and you are logged into the right iTunes account, again, I would recommend contacting Movies Anywhere for technical support. Yes it does. I only had a few iTunes movies and now I have 100s after I linked them all. There is a iTunes sync bug and it can take several hours or days before they all show up. Relax. OK, thanks for the tip on the sync bug, I will hang tight. It looks like my VUDU account linking needed to be configured both directions to/from Movies Anywhere, but I do finally have full visibility from both VUDU and Movies Anywhere libraries. I have fairly large iTunes and BD movie libraries, so it would be very nice if I could pull the BD library into iTunes via the VUDU Disc to Digital + Movies Anywhere process. But to evaluate that you must ask how long the license lasts. If this program goes the way of the DIVX flop, what happens to your purchases? Once attributed to you in iTunes will they remain with you forever? I would hope that once a purchase is "verified" in iTunes it sticks with the account, yes. Perhaps a brave soul would be willing to un-link or discontinue their Movies Anywhere account and see if the films remain in their iTunes library. That would be telling. Hey man, that’s what we come to you guys for. Aliens was remastered in 2010 so I assume the digital movie is the remastered version. Older movies that haven't been remastered are hit and miss when they are upscaled for HD. I have that remaster version. One of the few Blu-rays I own. I wonder if it is worth jumping through all these hoops to see if there is a 4K version out there waiting for me? Alien is one of my favorites. The remaster was done in 4K so I imagine it will be released at some point in UHD blu ray. I imagine they will stay in your library. This may not be the best example, but I bought the digital version of True Lies on Vudu a few years ago. For some reason, the movie studio pulled it and you can't buy the digital version anymore from anywhere. My copy is still in Vudu. Somewhat related: I did some more digging on the Ex Machina situation, because I just saw an ad for the Apple TV 4K featuring a pic from that movie on twitter like yesterday, and I wanted to make sure I wasn't losing my mind. Some folks on Reddit said the 4K/HDR copy of Ex Machina on iTunes actually looked terrible (like not HDR at all) and the copy was pulled. So there are still some 4K growing pains, I guess. (Update) - Since the complaint - iTunes has pulled this title from their list of HDR movies. I just rented this title (99c sale) and decided to watch it in its HDR glory. I tried both HDR modes - DV @ 24Hz and HDR10 @ 24Hz. Check stream info (down arrow key) indicates 4K HDR. But it definitely does not look anything close to other HDR stuff I have watched. Maybe I'm losing my mind but I think the Baby Driver 4K HDR version was pulled as well. Yesterday on my Apple TV, there was a picture of it on the top section where it advertised movies that are now in 4K. It's not showing up as 4K anymore. I know I watched it about a week ago and it was 4K Dolby Vision. EDIT: Forgot to add one movie I checked out that looks terrible is Hangover Part 2. It says its 4K HDR, but it doesn't look like that at all. Not sure if it's 4K growing pains or the source material is just being upconverted to 4K HDR. Never thought I’d make an account at Vudu…but it’s too good a deal to pass up. i can now ask people for Blu-Rays for Christmas knowing I can turn them into (much easier) iTunes streams. I’ve been avoiding discs due to the difficulty incorporating them into my ATV-based video lifestyle. I've been using Vudu for years. I think Vudu has the best streaming quality. Movies Anywhere is a great new service. Now you don't have to worry bout redeeming blu rays at either iTunes or Ultraviolet. It’s mostly just my Walmart hangup. Ive got one for Target, too. Hey, I notice in Movies Anywhere you can link you Amazon account. And Google Play. If you buy a movie through one of those services, does it link into iTunes as well? And I’ve downloaded amazon Rips of CDs I’ve purchased. Do they automatically link DVDs and/or Blu-Rays you buy to your Movies Anywhere if the account is linked? Yes. All the movies I've purchased (except Paramount movies) on Vudu are now in my iTunes library. If you buy a blu ray or DVD that comes with a digital code and redeem it on Movies Anywhere, your movie will be in the libraries of everything you have linked. Not all studios are on board though. One of the big hold outs is Paramount. I scanned Potter 6 and 7. Purchased on Blu Ray. They came over for me. Star Trek 2 did not. However, there's a caveat: The movies you convert in Vudu must also be available in the Movies Anywhere database. And as I discovered today, unfortunately that's NOT always the case. I was all set to convert several dozen films, but after converting 6 of them, I noticed that only 4 had shown up in iTunes. At first I was confused. But ultimately, a quick search in Movies Anywhere revealed that those titles simply aren't part of the Movies Anywhere library (and they were big, famous movies—not obscure ones). So, gwanberg, if in fact your accounts are properly linked, it seems you have the improbable misfortune of having converted 18 movies that simply are not in the Movies Anywhere database. I plan to call Vudu tomorrow to ask for a refund for the "missing" titles. And from now on, I'm going to search Movies Anywhere first to make sure each title is actually available there. You might consider adding this caveat to your article, because although this is a fantastic new development, we now know that movies are only added to iTunes if in fact they're part of Movies Anywhere. Successful conversion in Vudu does not, in and of itself, guarantee that the title will also appear in iTunes. Bottom line: Before converting a given title in Vudu, I recommend that users first search for that title in Movies Anywhere. If it's not there, this method will NOT work for that particular movie.